Your blog posts are the digital doors to your website for visitors. But once they get there, do they read a couple of sentences and then leave? Or do they click away to something else? Or do they dig deeper and buy something? Most businesses want their blog posts to work hard for them and generate leads like there’s no tomorrow. After all, we’re constantly told that content marketing is the number one way to increase sales and boost customer retention. But putting that into action is a lot trickier than it sounds. People struggle to get desired conversions. Hence, to help you leverage your blog posts, we’ve put together a guide to a few quick and easy tactics you can implement today to turn that disappointment upside down. The first blog optimization hack is to have an action-oriented headline that encourages users to read the content below it. Here’s a stat to boggle your mind: 8 out of 10 people will read your blog’s headline, but only 2 out of 10 will read the rest. This means you’ve only got a limited space to draw those 8 out of 10 people in and compel them to read the rest of your post. Because, let’s face it, if people aren’t enticed by your blog titles when they scroll through social media or search engines, they aren’t going to click through and convert. Use a tool like Headline Analyzer to determine whether your titles are on top form and be sure to brainstorm between three and five potential headlines before settling on the right one. 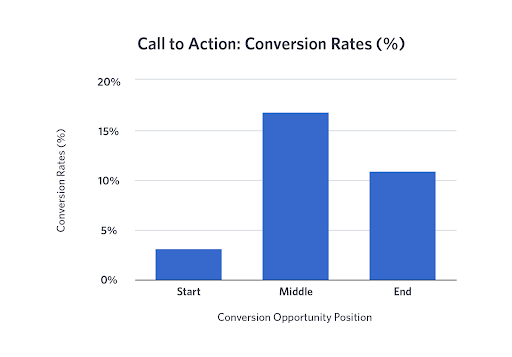 Right after your headline, the next blog optimization hack to focus on is your call-to-action. In fact, 90% of those who read your blog title will also read your CTA copy even if they read nothing else on the page. 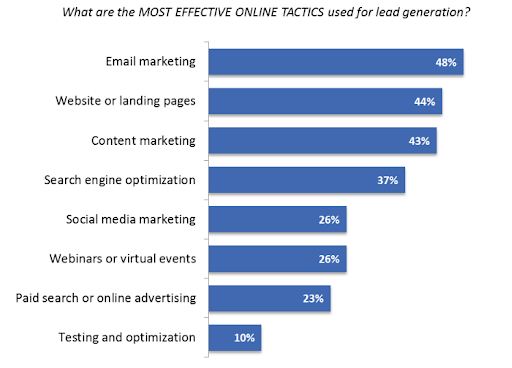 And because they’re getting eyeballs on them, CTAs have incredible conversion power. This is because people like to be told what to do next. How will your visitors know that you want them to check out a case study if you don’t tell them? How will they know that you want them to share the post or sign up for your newsletter if you don’t prompt them? Your CTA should be in relation to your headline or content. 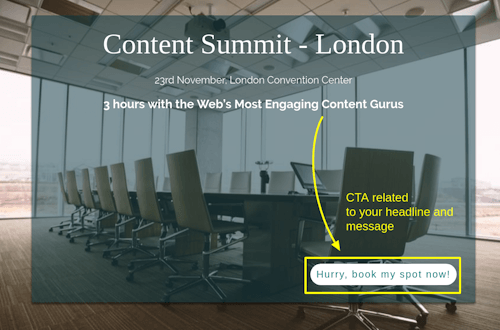 Your site visitors aren’t minded readers, and CTAs are a great way to push them in the direction you want them to go. Liked the overlay image above? Get more highly converting overlays here. We’ve already spoken about CTAs, but here we want to get more specific with what you’re asking readers to do. Basically, you want to get their email address so you can market to them in their inboxes. This the most successful marketing strategy, as you can reach potential customers directly without having to wait for them to stumble past you on social media. Because of this, it’s important that you give your readers enough chances to opt-in throughout your blog post. 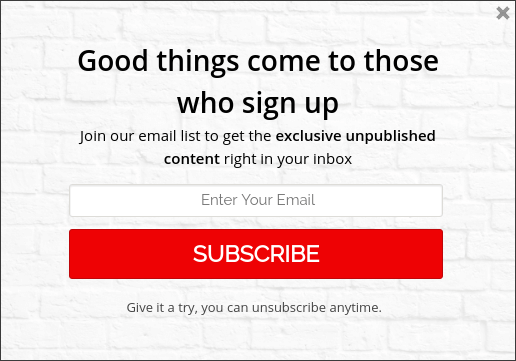 If you just have a sign-up box at the end, you’ll miss out on converting people who didn’t read all the way to the bottom. To counteract this, add an opt-in halfway down your blog post and, if you’re feeling zealous, you can even add one after the first few paragraphs to capture people that are really digging your content from the get-go. As well as static, on-page opt-ins scattered throughout your blog post, you can also implement a pop-up that appears when a reader has scrolled halfway down the page. This means they’re already interested and invested in a piece, and it will catch their attention more than a CTA that’s a part of the body text. You don’t want to get too demanding here, though, so simply give them the option to sign up or click out of the pop-up (and make sure it doesn’t show up again during their visit). Want more converting pop-ups based on different scenarios? Icegram has pop-ups for all – offers, email opt-ins, membership, newsletters, etc. You can target popup based on user behavior – after a time delay, scroll, exit intent. Content upgrades are blog extras that can be downloaded in exchange for an email address – they also happen to have crazy conversion rates. For example, if you’ve written a guide to post on social media, you might add bonus content like a social media publishing checklist that visitors can grab once they’ve finished reading the post. Again, this gets you potential customer’s email addresses which you can then use to build and nurture relationships and market your services. 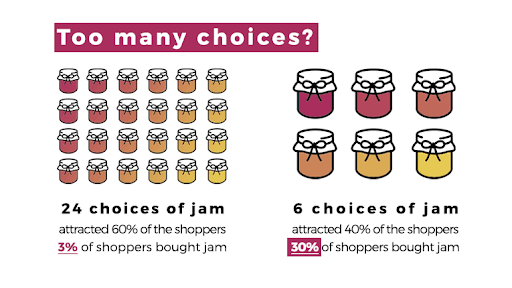 Providing too many options can cause consumer paralysis and, rather than taking the next steps, your visitors will freeze up and navigate away from your site – not what you want. If your one goal for a blog post is to get people to download a case study about your product, make sure that’s the only option they have. Don’t offer them a downloadable checklist, ask them to share the post, or encourage them to comment if you really want them to get that case study. Despite being well and truly entrenched in the digital age, word-of-mouth marketing is still one of the most powerful conversion tactics out there. Are you more likely to buy a pen that you’ve seen modeled on a shiny ad or one that your friend recommended because they absolutely loved it? Social proof is the online equivalent of word-of-mouth marketing, and by providing reviews, user-generated content, and case studies that offer an insight into how your product has helped others, you quickly build trust and credibility with your audience. And, when someone trusts you, they’re more likely to convert. Blog posts might seem like unnecessary additions to your site, but they have the power to be incredible conversion machines if you know what to implement and where. Getting visitors to your site is the hardest step in the sales funnel but, once they’re there and loving your content, you can implement techniques to build relationships with them, encourage them to give you their email address and, ultimately, become loyal, repeat customers. 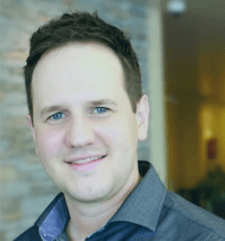 This post is written by Ryan Gould, Vice President of Strategy and Marketing Services, Elevation Marketing. Cool headline you’ve got here. It’s awesome that you’ve shared this hacks. Nowadays blog optimization is a must. And it is one of the needed weapon for conversion, but it matters how specific your goals are.